I finally did it. Last November, I went to Malaysia and experienced my first ever visit at Sephora in Queensbay Mall Penang. I used to watch YouTubers saying they bought their makeup in Sephora but have never been to a physical store ever until that very day. It was such an exciting moment for me. The thrifty side of me was searching for the least expensive makeup in the store but my eldest sister was quick to remind me that shopping abroad is a once in a lifetime thing. It is not like I can comeback to Malaysia whenever I want. And so I decided I will buy one item from my beauty wishlist. After rounds of exploring the area I saw this Becca Glow in the Go Kit and it was in Champagne Pop! I didn’t let go of the box until it was time to pay. I was so happy. Ecstatic really to have my hands on this Becca X Jaclyn Hill Shimmering Skin Perfector in Champagne Pop. And today I will be sharing my thoughts about it. Let’s begin. Why is Becca Highlighter in Champagne Pop so famous? You might be wondering why I’m so dead serious in including this highlighter in my beauty wishlist. Well, there are a lot of reasons and factors involved. 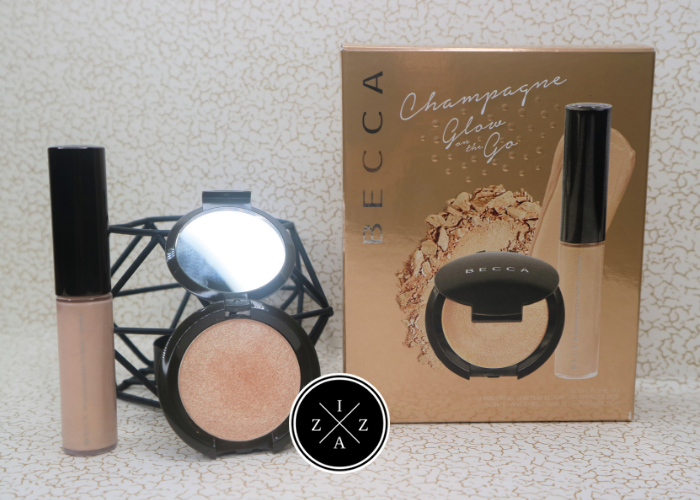 The Becca Highlighter in Champagne Pop was actually Jaclyn Hill’s collaboration with the brand Becca. Jaclyn Hill is a famous YouTuber and at some point I was a huge a fan of her. Becca highlighters are just on another level in terms of formulation. Even the other shades they offer are raved by a lot of people in the beauty community. There are A LOT of good reviews about Champagne Pop especially for how it perfectly matches every skin tone even medium toned like yours truly. It is a peachy, rose gold highlighter that gives a beachy glow when the sun hits you. I wasn’t able to find a full size of the Becca Shimmering Skin Perfector in Champagne Pop so I ended up buying the Becca Glow in the Go instead. 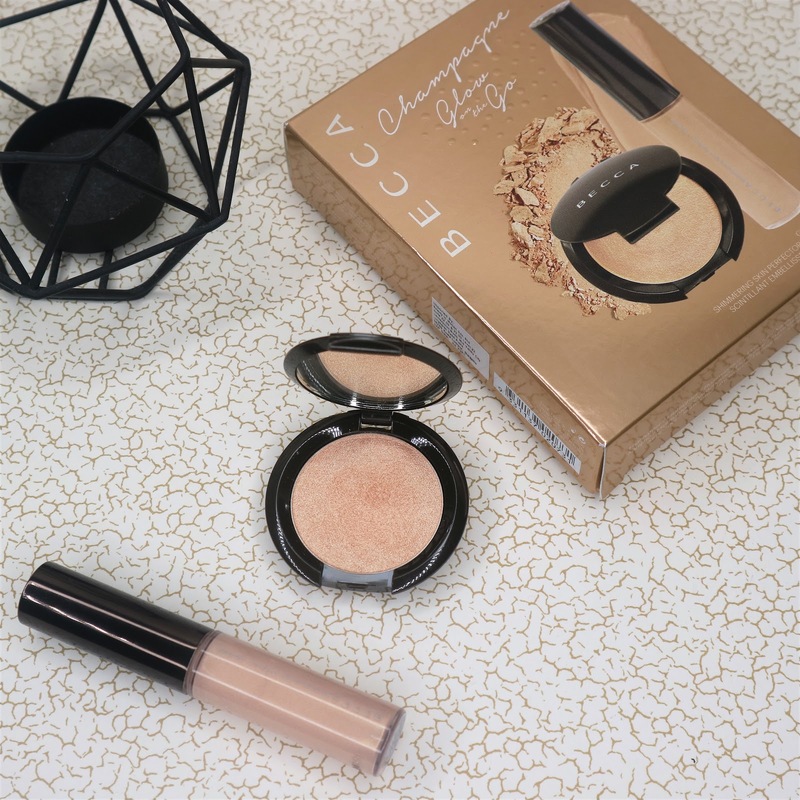 The Becca Glow in the Go includes travel-sized Becca Highlighter one in powder form and the other in cream. So, you basically get a powder and a liquid highlighter in the shade Champagne Pop. Is the price worthy? Well, the full sized retails for Php 1900+ so considering that you get two products for the price I guess that’s okay. Highlighters are not that easy to finish because you only need a little amount to put on the high points of the face. I also don’t intend to use it on an everyday basis as well. How I use it. For the powder I use my fingertips and pat a layer on my cheekbones, brow bones, nose of the bridge and cupid’s bow. I make sure to apply the product after blush and powder so it sits on top of everything like a true highlighter. The liquid/cream I sometimes mix with the BB Cream I am using or I put it before setting my face with a powder. To be honest, even if this product doesn’t work for me I will still buy it just to have it in my makeup collection. Haha. But thankfully it works! And I am obsessed with how good it looks. Okay let’s breakdown the things I like about this highlighter. First, you know that highlighter that can give you golden hour glow? This is it! The shade is really a match made in heaven for morenas. It gives a natural and subtle glow. Formula-wise you won’t be disappointed. It melts like butter when applied, it doesn’t accentuate the pores and you don’t see any glitter aspect of it. Both the powder and liquid highlighter gives a dewy look which is what I am aiming for at the moment. Not oily, not overwhelmingly shiny but just the normal dewy look. Buying the bundle proved to be a great choice because a little goes a long way with this product. If you are looking for a highlighter to invest with then this maybe the one you are looking for. I am really enjoying this Becca Highlighter in Champagne Pop so much and for the formula it is worth every penny! What do you think about Becca Highlighter in Champagne Pop?